I think baking would be a lot more fun if it didn’t involve so much washing up. 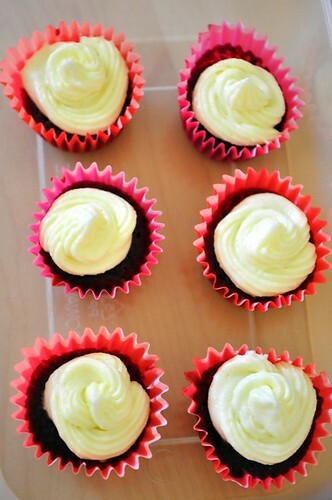 I spent my Saturday morning baking indulgent and decadent Red Velvet Cupcakes (recipe from thecakemistress ), possibly the most fattening cupcakes around with sinful thick cream cheese frosting. Jo’s getting this box of mini cupcakes when I see her tomorrow. As you can see, piping frosting is obviously not my forte. They look like lopsided rosettes (T__T), but at least they’re yummy :). 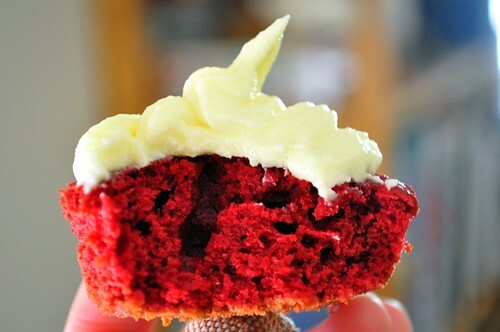 The redness of the ‘red’ velvet cupcakes aren’t very evident until you bite into one, very appealing colour, reminds me of Valentine’s day. 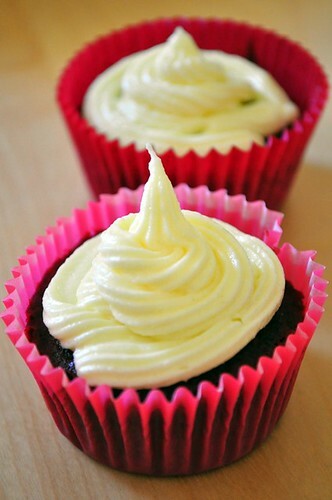 This cupcake is quite ‘cakey’, moist and morish. The good thing about baking cupcakes, you actually know how much sugar goes into these things so it stops you from devouring them like Cookie Monster or should I say Cupcake Monster. 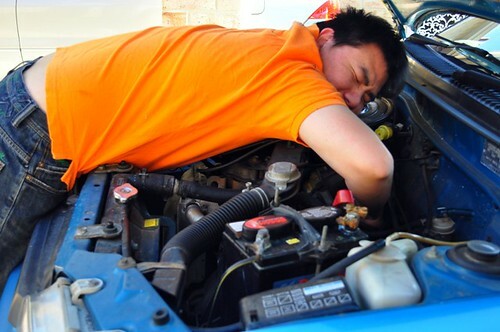 Question of the day: Why is Gerry hugging the car engine and is he in pain or in ecstasy? Winner gets a Red Velvet cupcake! Heat the peanut oil in wok, add chicken. Stir fry until mixture begins to caramelise then add the ginger, garlic, chillies, spring onions, snake beans and peanuts, and stir-fry for 2 minutes. Add ShaoXing wine, lemon juice and honey and cook until liquid has reduced and thickened into a sauce. Transfer to serving dish and garnish with Thai basil and fried shallots. After a mini hiatus from the kitchen, I’m back with this recipe that I tried from my Teage Ezard cookbook (the one that Gerry bought for me). Once I read the words palm sugar, ginger, garlic, fish sauce, shaoxing wine, basil,I knew I had to try to cook this dish because it incorporates some of my favourite cooking ingredients. I didn’t add snake beans because I don’t like beans but added more spring onions instead. The flavours came out exactly how I like my Thai dishes, sweet, sour, slightly spicy (green chillies have this wonderful spicy kick yet sour flavour) and with that fresh aroma of lemon juice and fragrance of ShaoXing wine. It’s a keeper recipe so do try it. Lunch tomorrow is a cucumber, tomato and basil salad with some of the stir fried chicken and cashew nuts. We’ve officially moved in to the new office and the lunch room feels like a different world that I’m having trouble going out and actually doing work. The first yoga lesson of the season was also held today and it was soo good, made me realise how much I’ve missed yoga. The weekend was so glorious that Mondayitis hit me extra hard today. So I’m back to counting down the days to Friday again (-___-). Dredge chicken in the seasoned flour. Add olive oil or butter to pan. 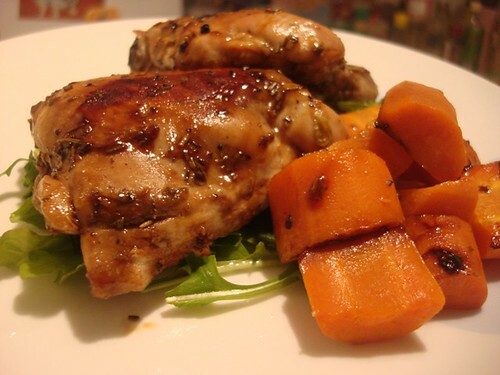 Brown chicken in pan till light brown on both sides. Then add the mushrooms, onions, ham and fry till onions are soft and translucent. Add wine. Simmer covered on low heat until chicken is done, around 20 minutes. 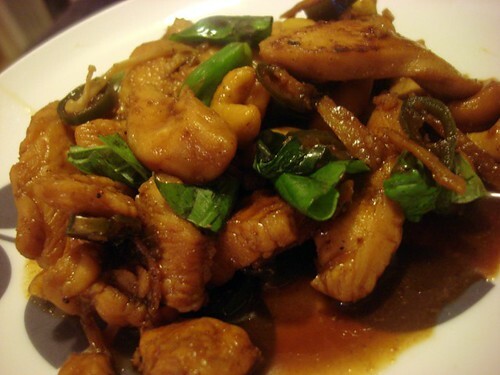 Remove chicken from frying pan, leaving onion and mushrooms. Shake 1 tablespoons flour and the heavy cream into pan. Stir into the drippings in the frying pan. Flavor with tarragon according to your taste. Cook until sauce thickens. Pour over chicken and serve. Garnish with additional herbs of your liking. This was one of the first western dishes I learned to cook back in my uni days. 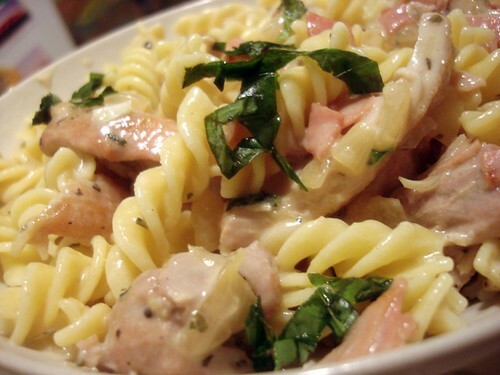 I used to serve it with roasted potato wedges but nowadays I usually cook up some fettucine or spaghetti and add it to the chicken for a cream based pasta. It was another horrendous day at work today, so bad that my colleagues were really angry on my behalf, still, I felt comforted that at least my own teammates were so supportive. Sigh, if only people could be professional and not shoot the messenger. On the bright side, on the way to work and back from work, I saw full arch rainbows in the sky! So pretty, I love rainbows…. I was too greedy and made so many wishes that now I think none of them will come true (T____T). 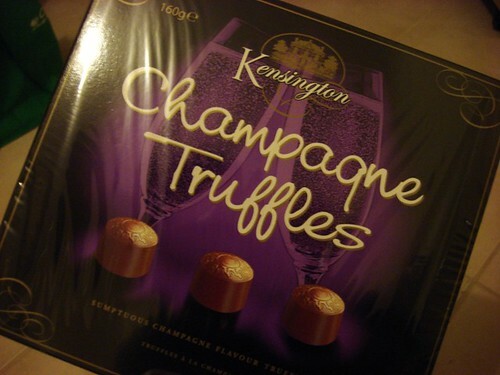 Gerry has returned from his Brisbane/Melbourne trip and he bought me a present again! 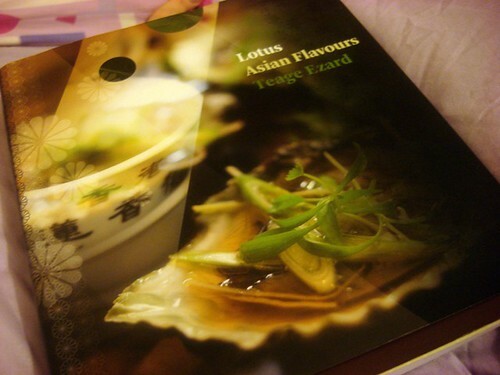 Another cookbook, this time it was a Thai/Malaysian food cookbook which I really really like. Thank you Gerry!I actually read this book a couple of years ago in Borders, back then (actually now still the same) I couldn’t bear to fork out money for cookbooks and would go to Borders, sit there with my favourite Irish Nut Creme coffee and try to memorise these recipes. Cheapskate or what?! But it was actually very fun lah. Home cooking for the past week. Jo’s reaction to this dish was ‘wah, how come today get instant noodles? !’ After so much home cooked food, it’s actually a treat to eat yummy instant noodles, especially our favourite Indo Mee. 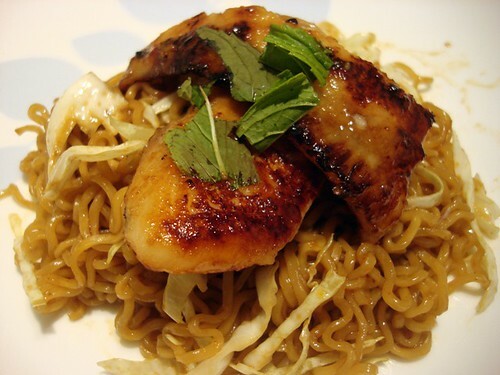 I topped the noodles with grilled basa fillets marinated in a mixture of white miso paste, sugar and mirin. Lunch the next day was thinly shredded raw cabbage with the fillets, very nice even eaten cold. I’m very proud of this recipe! I wish I could post up a recipe but then I didn’t take any measurements. 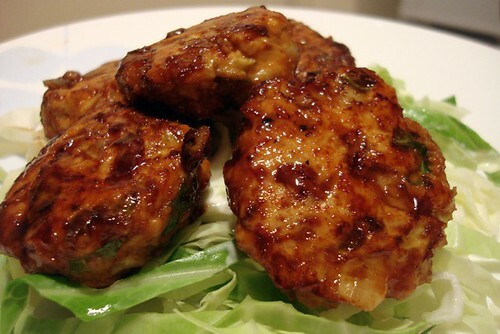 A variation from my teriyaki hambaagu, these mini chicken patties are made of minced chicken, chopped onion and cabbage mixed with an egg and seasoned with a little salt and pepper. I pan fried the chicken on low heat and basted the golden patties with my teriyaki sauce. Served on top of a bed of shredded cabbage (in case you haven’t noticed, shredded cabbage are my new favourite salad veg), it was really quite yummy (=^__^=) and Jo loved it. 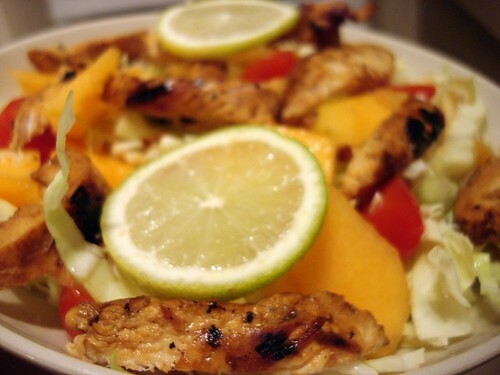 Tonight’s dinner was lime chicken salad with grilled chicken, shredded cabbage, rock melon and grape tomatoes. 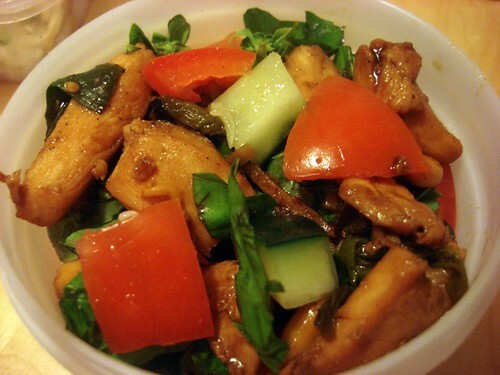 The dressing was made of fresh lime juice, light soy sauce, fish sauce, rice wine vinegar and palm sugar. I think it will be an eye opener for lunch tomorrow, goodness know I need it. Work has been really tiring and I find myself constantly wondering ‘am I doing any good? am I actually helping?’ Very early in my career at the new place, while attending a farewell morning tea for an exec, the exec gave a speech saying ‘I had to leave, because I was too tired of seeing nothing being done, nothing working, so I am going back to where I came from, to rest, because I am too tired’. I hope I’ll never be in that situation even though I see many of my colleagues spiralling towards that weary road. I like to think that I’m still optimistic and will never give up. On a bright note, I found this box of chocolates on my desk this morning. A secret admirer? I can already imagine Jason going ‘oooh’ and raising his eyebrows. But sorry to disappoint you, it was from a colleague who said that she wanted to thank me for all my help in the past few weeks. Isn’t that sweet? My other colleague also bought me a crystal elephant figurine (with sakura flowers on the back, I thought of Jo immediately but sorry hor, it’s on my office desk) from her Thailand holidays. I have nice colleagues. I was still feeling down when I received a phonecall to go for an interview next Monday. My boss has already offered to give me mock interviews, I’m not so keen on the job, but an interview experience is an interview experience. I’ll try my best. A while later, I received my travel itinerary. Remember how I mentioned I was going to the heart of Australia for work? 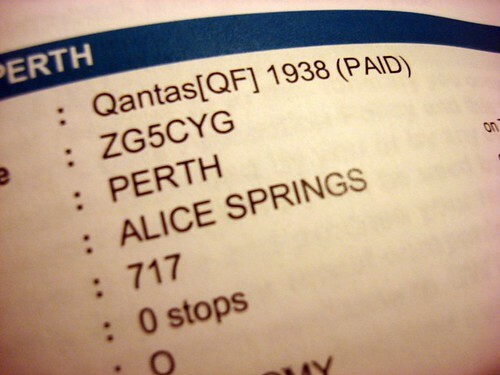 I really meant Alice Springs, yes, I’m going to the Northern Territory, the red earth. Perhaps I will only get to see the interior of the hotel, but I’m hoping for more, I want to see and experience the real Aboriginal Australia. I fly next week. I knew it was going to be an exciting month, but now it’s a bit too exciting for me. I hope all goes well *fingers crossed* wish me luck!